►Are you having trouble attracting good employees? ►Are your "stars" moving on to better opportunities? ►Are you effectively communicating your vision & expectations to your employees? This whitepaper explores what it takes to recruit a stellar team. You will learn how to identify different personality types and balance them in order to create a good fit. In addition, it investigates the 5 keys to a winning team and putting it all together. 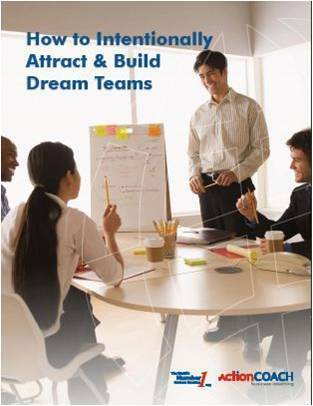 Please fill in the information below and ActionCOACH Steve Goranson will send you a complimentary E-Book entitled, How to Intentionally Attract & Build Dream Teams.